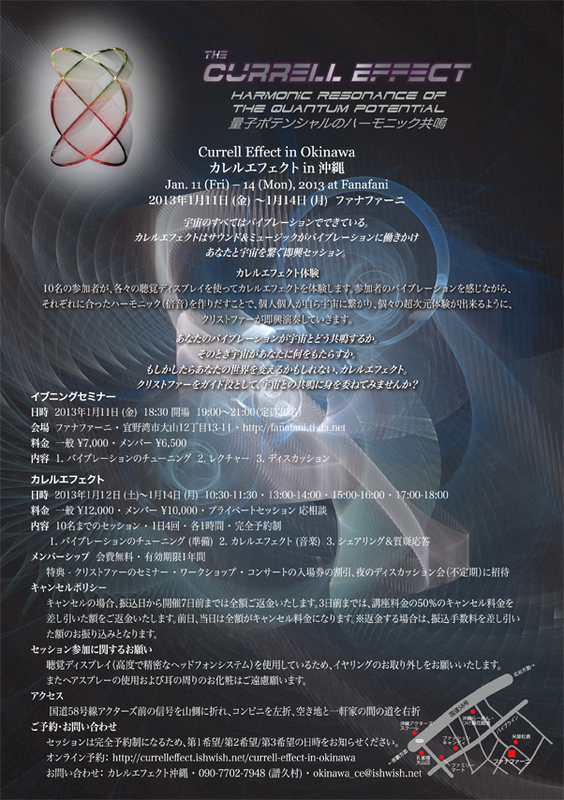 Reports and photos of the Currell Effect version 2, which took place in Ashiya and Tokyo, are posted on the Currell Effect website. Please click the link below. Now is the time for change. Change is no longer something that is in the future that we can ignore. The world is changing very fast. Unfortunately, these changes are not all positive. These changes are bringing more and more distortion and it is accumulating rapidly every second of the day. It has been my observation that existing traditional methods of raising awareness and expanding consciousness (the ones that actually work) are too slow to counteract the enormous daily accumulation of vibrational distortion that is occurring on this planet. This is the reason I developed the Currell Effect. The Currell Effect process can help dramatically accelerate consciousness expansion. Hope many people can experience this process. I want to thank everyone for their enthusiasm and support of the Currell Effect! 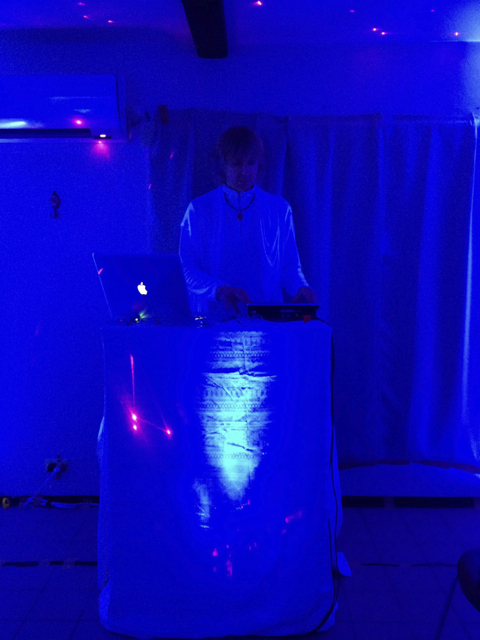 After years of research and lots of hard work, I was able to take a combination of existing technologies and theory, combine it with new concepts, to create a method, which can potentially link the vibration of the human spirit to the vibrations of the universe. 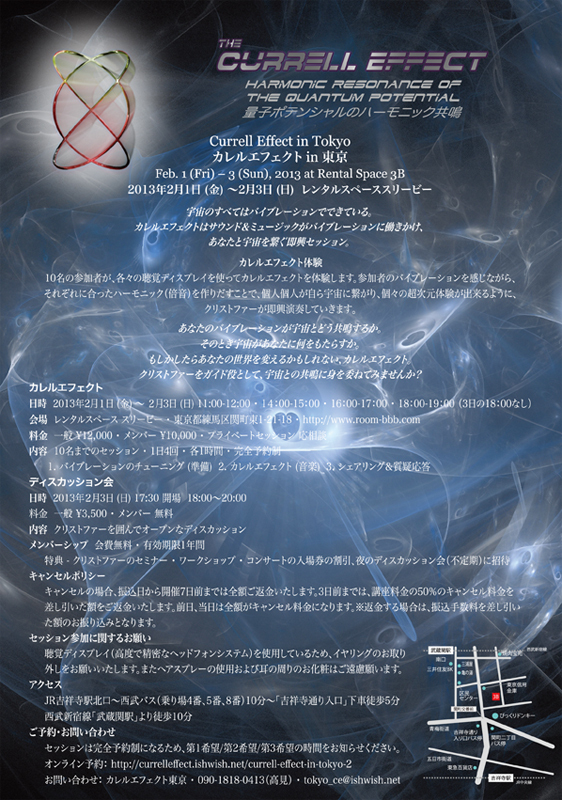 On November 23, 2012, the Currell Effect was unveiled to the public for three days in Tokyo. 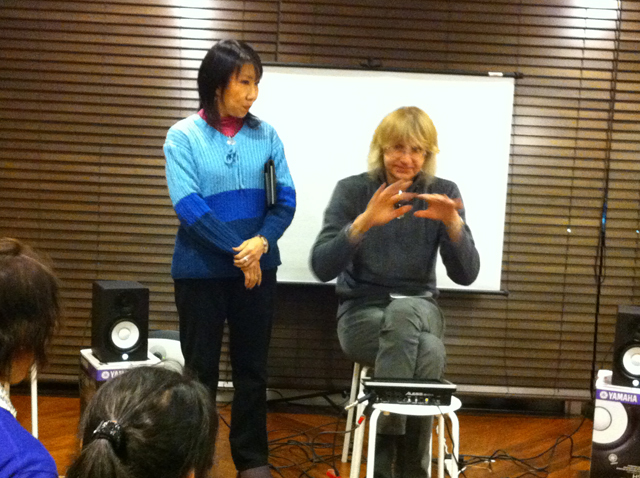 Shortly thereafter, we followed up with sessions in Kobe, Okinawa and a return visit to Tokyo February 1st, 2nd and 3rd 2013. There also was quite a high rate of repeat sessions by many participants. After a successful first run, it seems that we have hit an approximate 97% success rate based the written feedback from over 300 participants. This percentage ratio of success is quite extraordinary considering it was the first time the Currell Effect was presented to the public. After a total of 12 days and over 300 participants, I was able to gather a lot of information. This information was invaluable in helping me be able to optimize the Currell Effect. This included changing the things that were found not be optimum, fine tune things that were working and to make sure the things that are working well are maximized. So I am announcing exciting new news….the Currell Effect Version 2 is being released! To explain the difference between version one and version two, I have to explain a bit how the Currell Effect works. 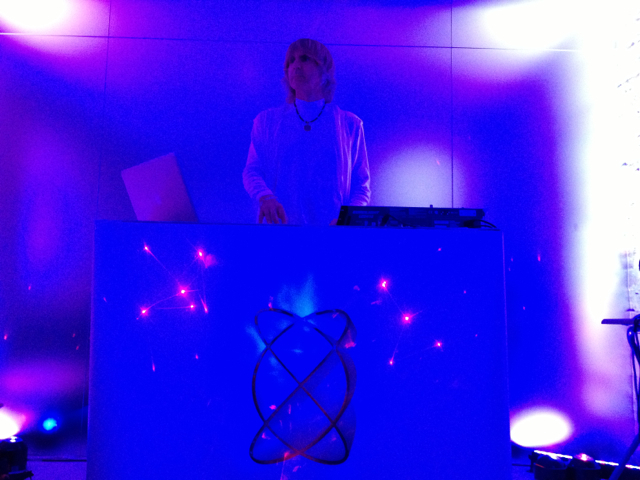 Essentially, using a series of audio frequencies, I am able to energize the resonant field that exists around the physical body. 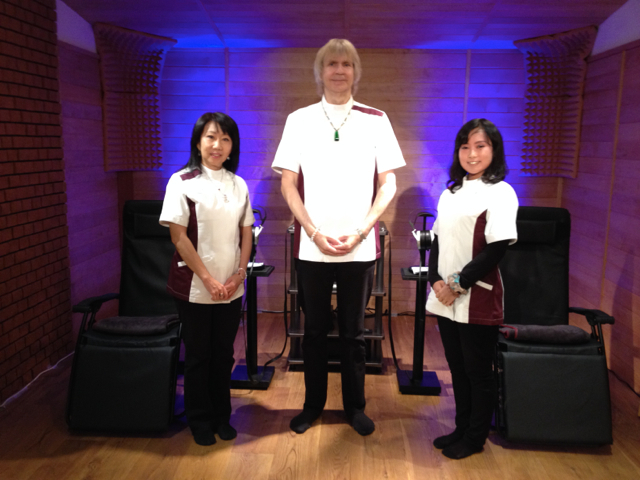 The frequencies used are harmonics and subsets of the extremely high frequencies of the spirit. The spirit basically interacts with the physical universe using extremely high wavelength components of the electromagnetic spectrum (the frequencies of light and beyond). Since wavelengths in the audio spectrum are very low, they need to be piggy backed or “modulated” onto much higher “carrier” frequencies in the electromagnetic spectrum. 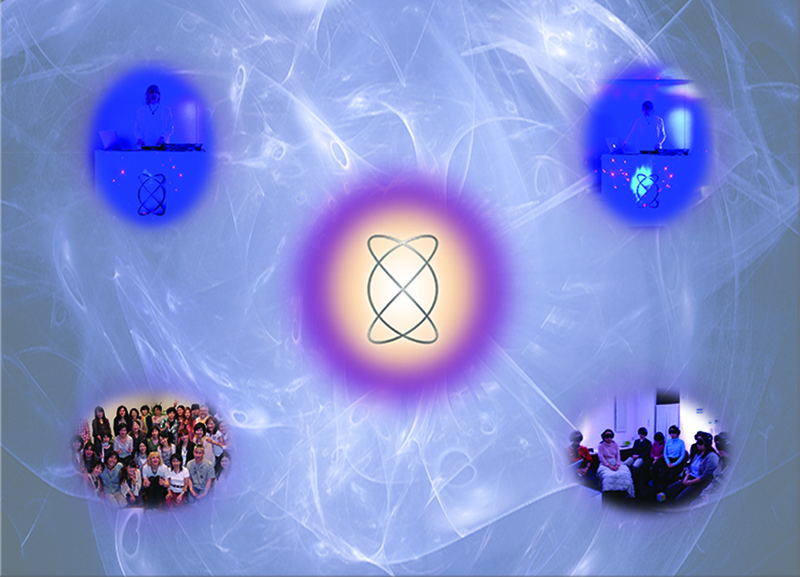 This modulation is created by exciting a combined resonate frequency of the group of participants. This is done in the tuning portion of the Currell Effect session. Once this resonate frequency is found and energized, many harmonics are created which reach into the electromagnetic spectrum. 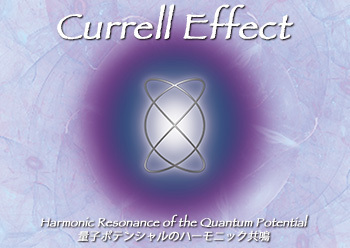 As a result, a link (resonance) with the frequencies in the universe is obtained and the Currell Effect begins. In order to connect with various frequencies in the universe, a series of frequencies are required which will resonate with each person. At the same time, that harmonic spectrum, once modulated, will need to continue to resonate with each participant AND resonate with frequencies of the universe. Initially, the audio content of the Currell Effect must not exceed the conscious awareness of the listener (the reality of the listener). If the content of the audio goes beyond the reality of the listener, no resonance will occur and no connection with the universe will be made. 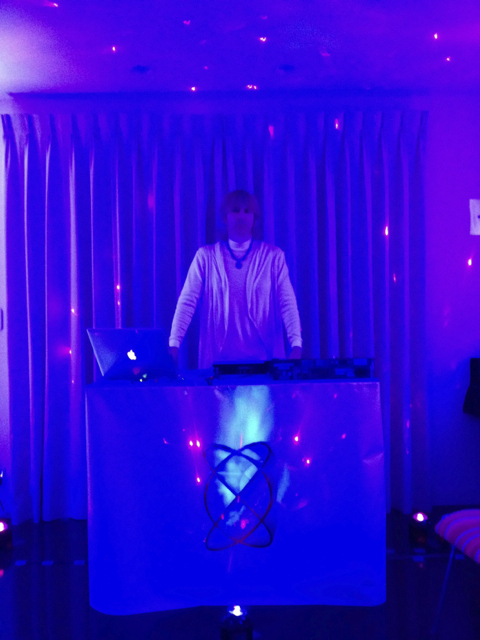 So, the bandwidth of audio frequencies used in a Currell Effect session must not exceed the participants reality. 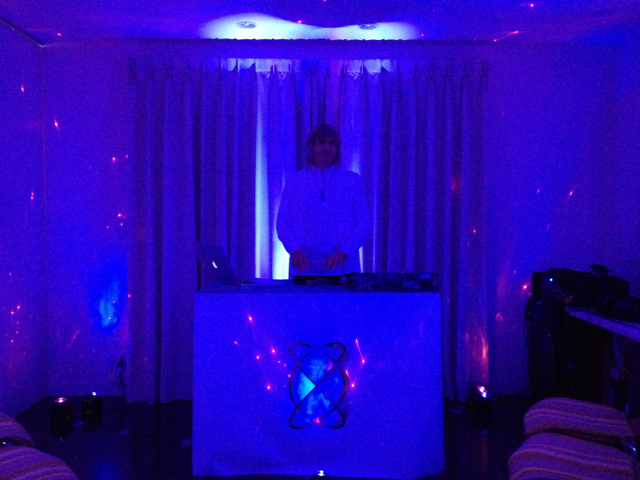 In order to make sure the connection is maintained, I am always adjusting the audio frequencies in real-time. 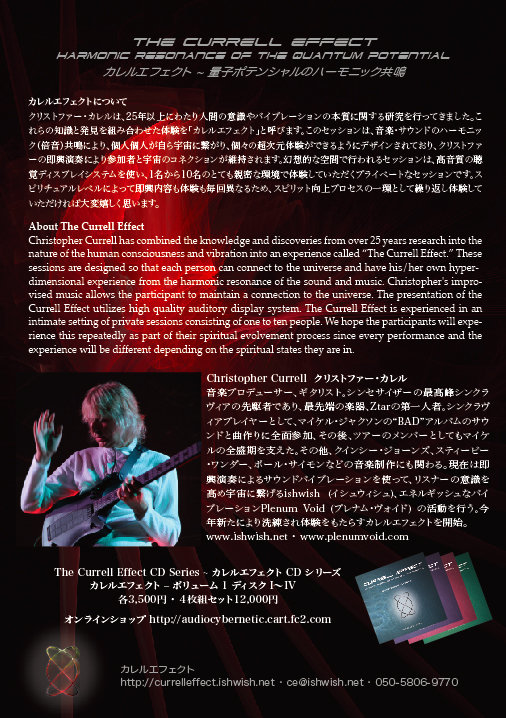 For the first series of Currell Effect sessions, I decided on a range of frequencies based on empirical data. The results of The Currell Effect indicate that that range was basically correct. But what was interesting is the data feedback of repeat participants. Each session was different for each individual. 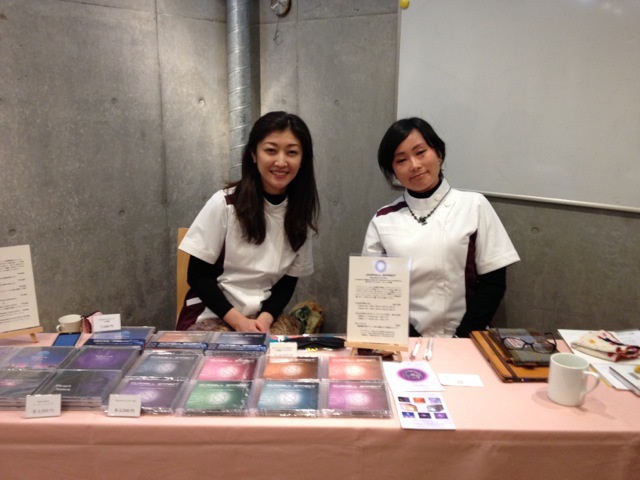 As the number of sessions increased, the participants awareness increased and they resonated less and less with the existing frequency range of the Currell Effect. This is actually very good news…it means that I underestimated the potential range of frequencies that people could confront. I realized I can increase this range significantly. The Currell Effect version two does exactly this. The overall frequency range has been increased. 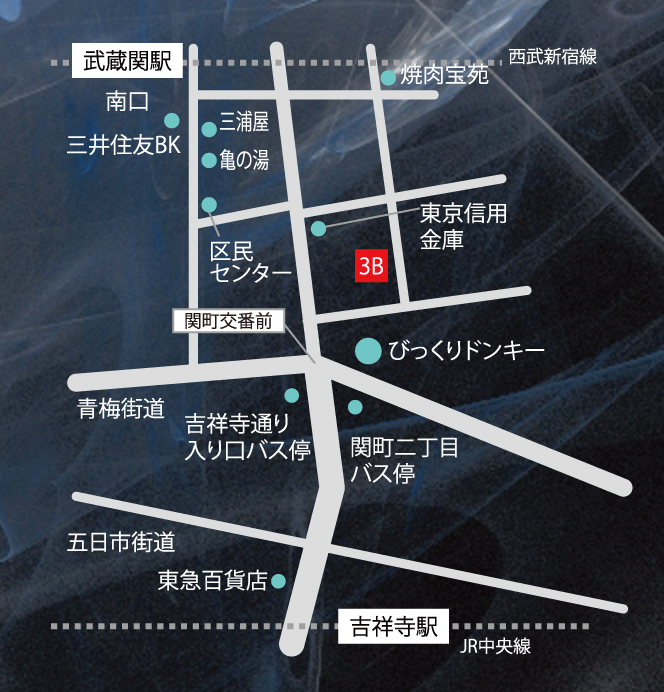 How this translates to the participants basically manifests in two areas. 1. The audio content is completely changed (expanded frequency content). Also the tuning has changed as well. The tuning will create a higher resonate group frequency than before. 2. 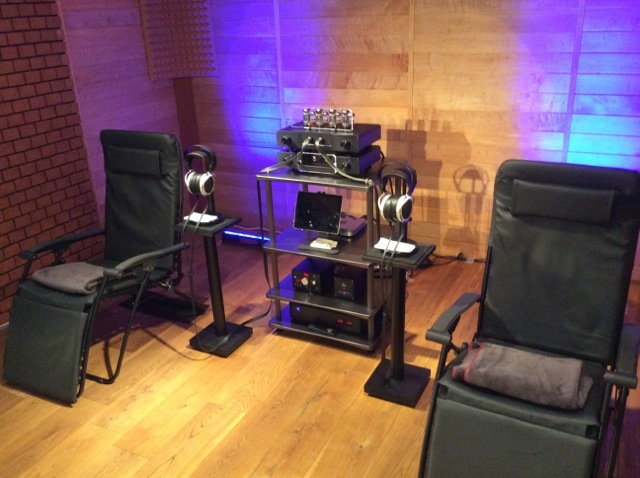 In order to facilitate this increased frequency range and content, the hardware playback system had to also be modified. Instead of the playback being 16 bit 44.100kHz sampling rate (the previous system was the same quality as a CD), it is now increased to 24 bit 96.000kHz sampling rate. This means the quality of the playback is now more than double that of an audio CD. 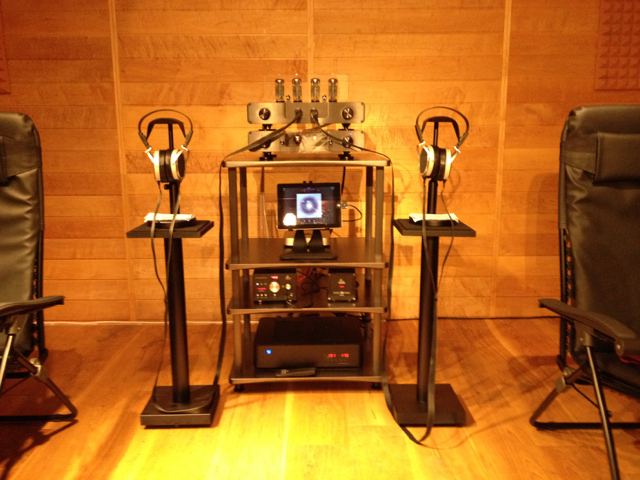 To bring the playback hardware into line with this high quality, I have added a much better power amplifier. The rest of the system will maintain that level of quality without any problem. What all this means to you, is a much more powerful and expansive connection with the harmonic resonance of the universe. One last bit of news, in June, I am off to Boulder, Colorado for a month. 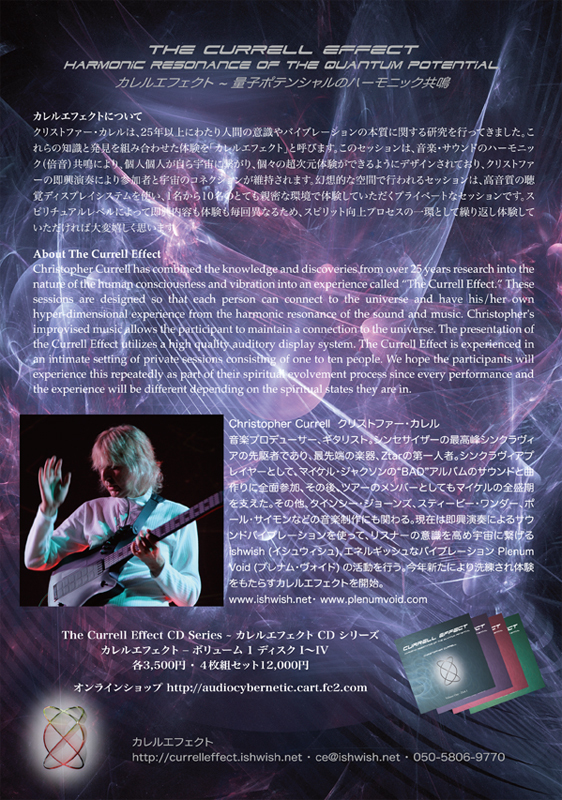 I will take time to write the definitive book on “The Currell Effect…Harmonic Resonance of the Quantum Potential.” It should be available before the end of the year. Again, I thank all of you for your continued support. Together, we can all journey freely to our true home in the universe. 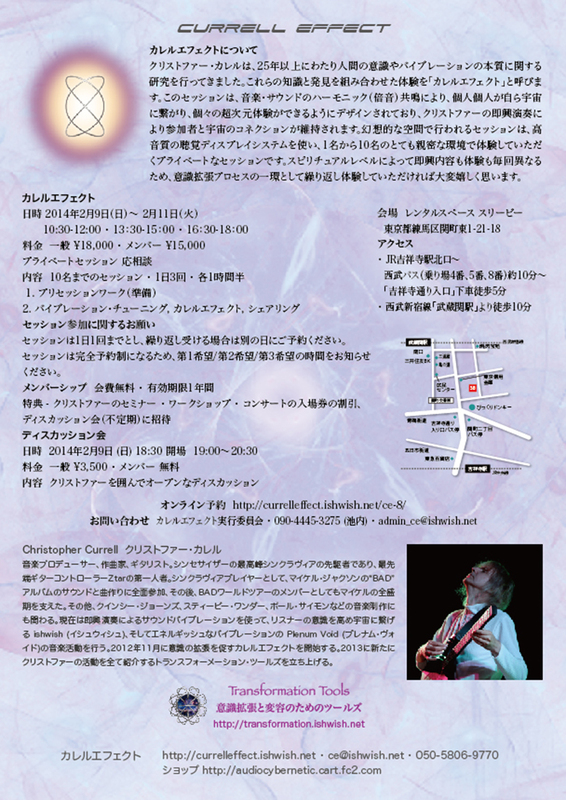 The Currell Effect in Okinawa! NOTE: We are accepting 10:30 reservation only for Jan. 14th. Update on the Currell Effect Schedule! 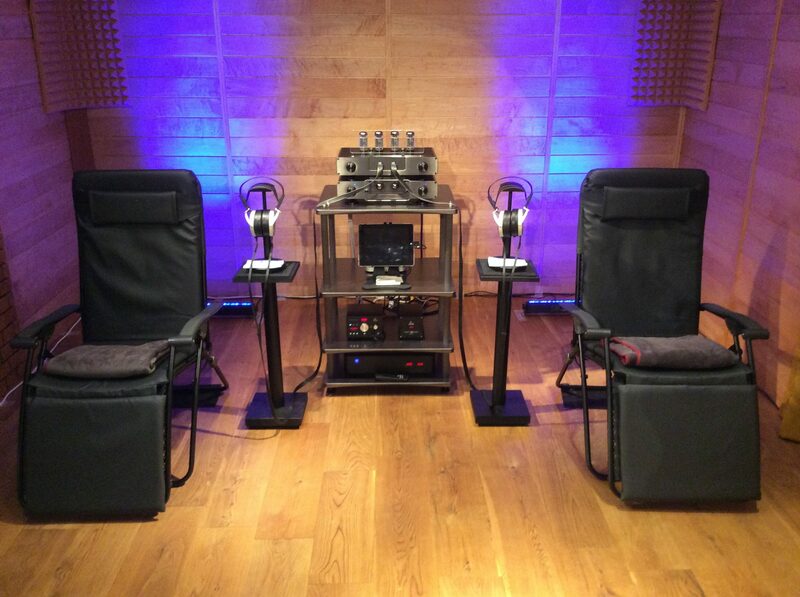 We are very pleased to announce that we now have three Currell Effect sessions scheduled. 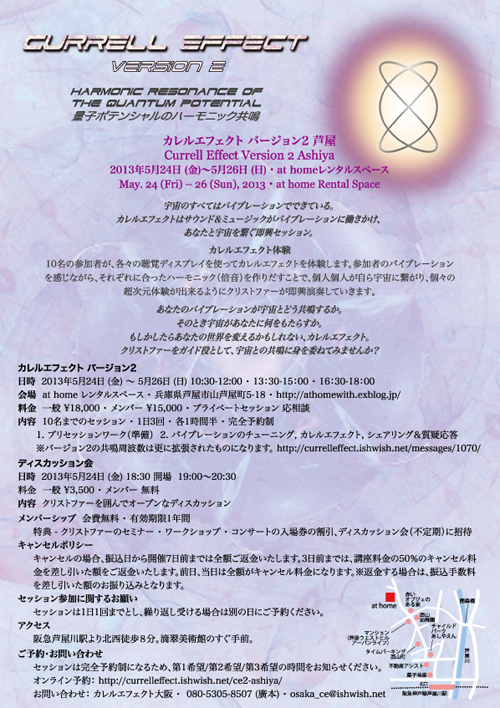 The first Currell Effect in Tokyo, the second in Kobe and the third in Okinawa! Session: 4 time a day, 1 hour each, Reservation only. 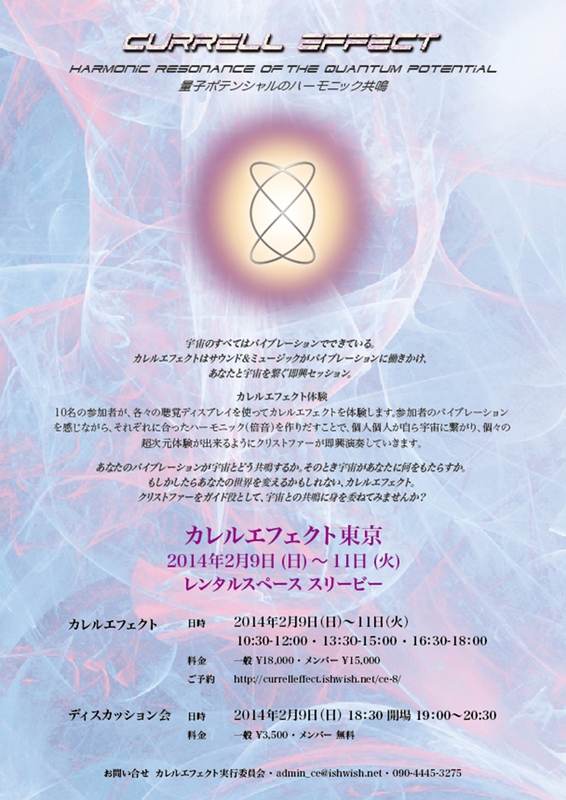 * There will be an evening seminar on Jan. 11th (Friday). Details will be announced shortly. 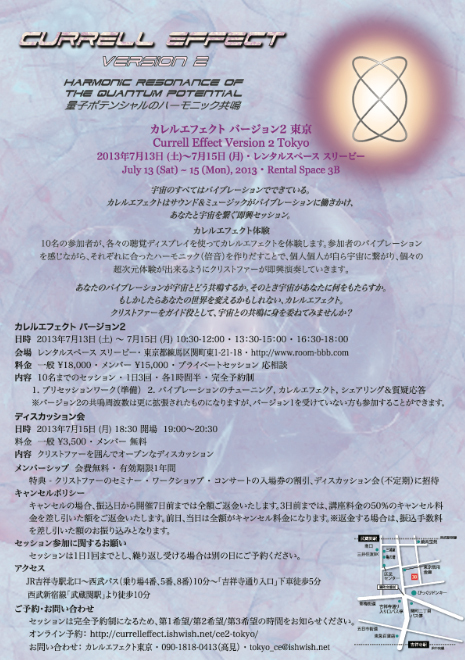 We will be holding a Discussion Group with Christopher on the last day of the Currell Effect Tokyo. 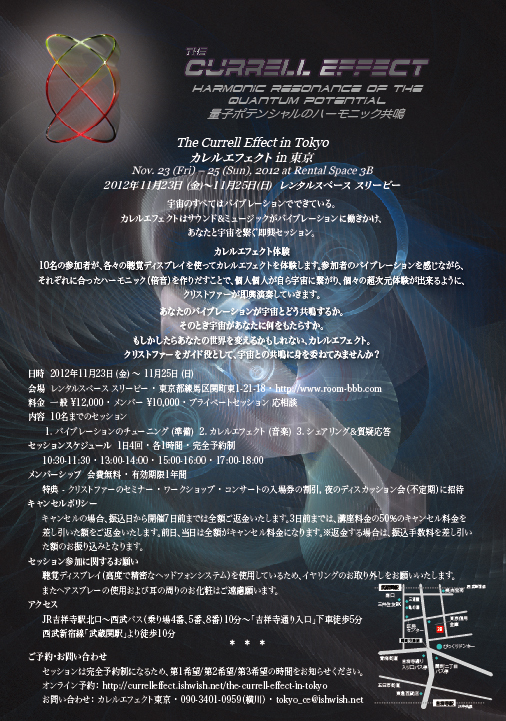 People who have participated in the Currell Effect and those who have not participated yet probably have questions to ask him. It will be a very open discussion gathering. Hope to see you there. ANNOUNCEMENT - CURRELL EFFECT UPDATE! 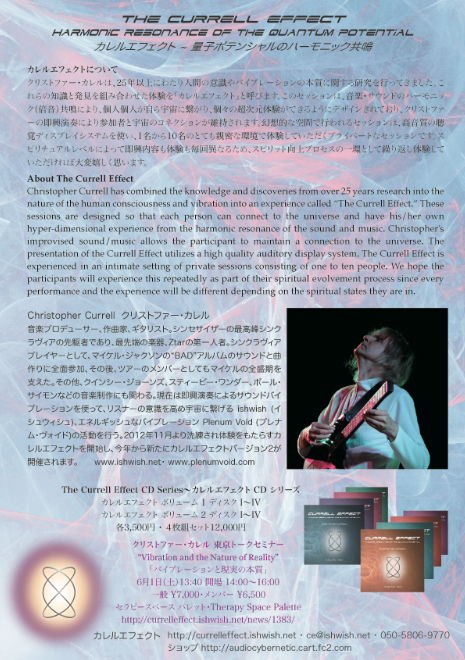 We are very pleased to announce that we now have the Currell Effect Official Website! 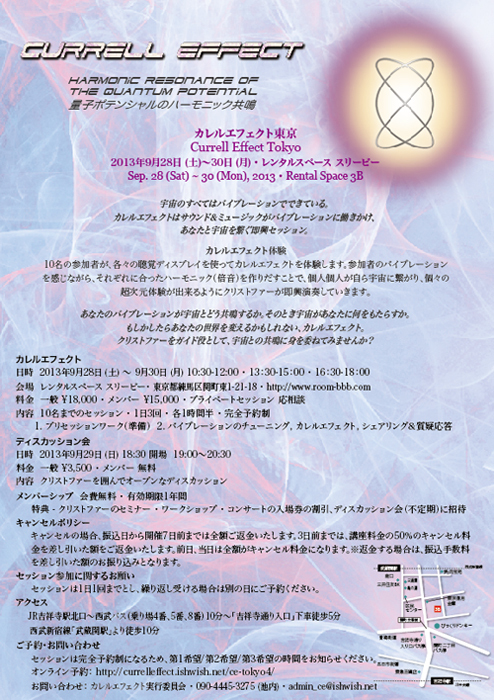 There are information on the Currell Effect as well as session schedules. This blog will always be bilingual but I will continue to add more English pages. Please feel free to contact us at ce_ishwish.net. Christopher Currell has combined the knowledge and discoveries from over 25 years research into the nature of the human consciousness and vibration into an experience called “The Currell Effect.” These sessions are designed so that each person can connect to the universe and have his/her own hyper-dimensional experience from the harmonic resonance of the sound and music. 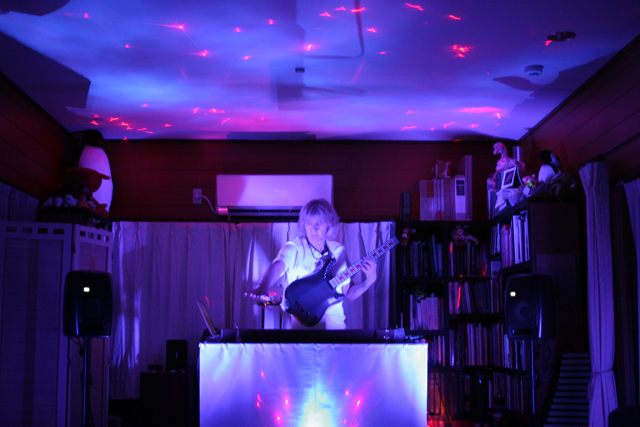 Christopher's improvised music allows the participant to maintain a connection to the universe. 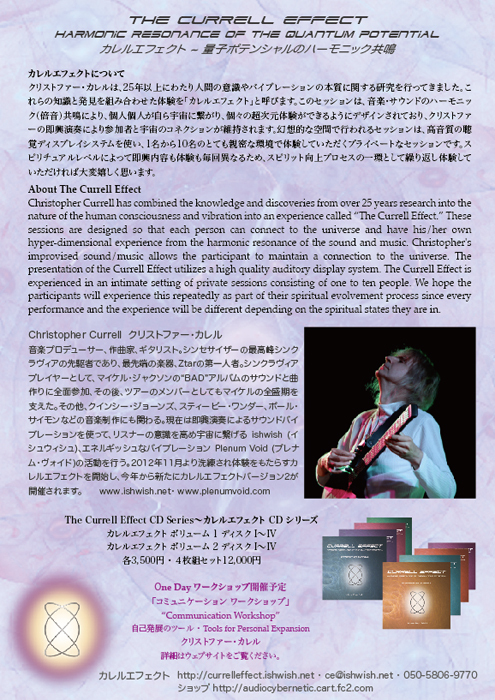 The presentation of the Currell Effect utilizes high quality auditory display system. 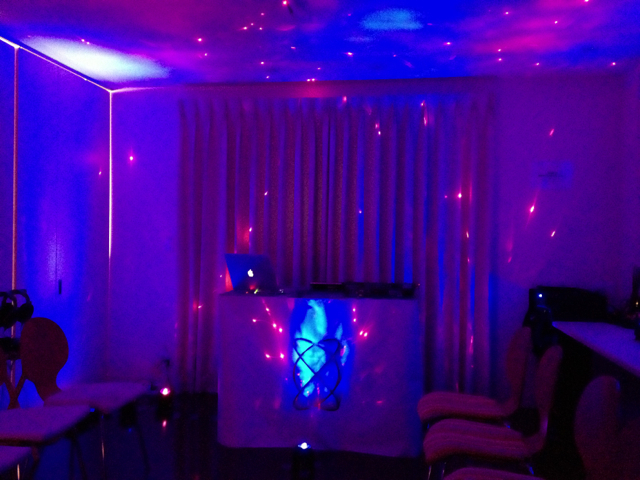 The Currell Effect is experienced in an intimate setting of private sessions consisting of one to ten people. 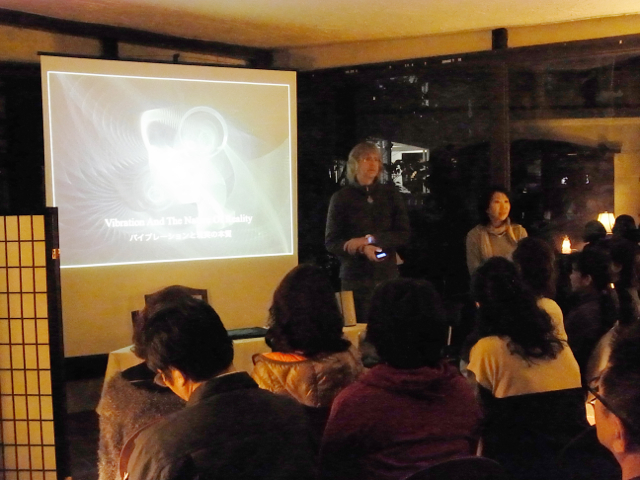 We hope the participants will experience this repeatedly as part of their spiritual evolvement process since every performance and the experience will be different depending on the spiritual states they are in. The Currell Effect demonstration was held for the support members on Aug. 26 prior to the offical launch. 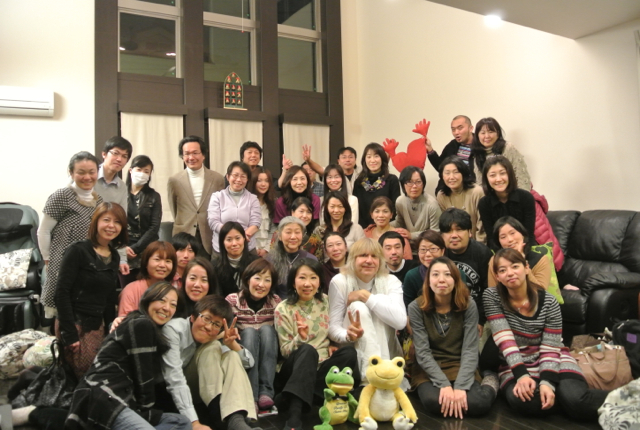 The participants gathered from all over Japan...Tokyo, Shizuoka, Nagoya, Osaka and Okinawa, as well as from LA. The Currell Effect will start very soon. Stay tuned!